​If you can't decide which type of sun shelter to get for your garden, deck or patio, you may find this article useful. We will provide here a detailed description of gazebos and offset umbrellas, and we will present you the best and most popular ones bought by Amazon customers. ​An offset umbrella (also known as cantilever umbrella) is different from traditional umbrellas, because the umbrella base carrying the pole will be offset from the center of the umbrella, and typically not found underneath the umbrella itself. This is both very convenient from a functional point of view, and it can add stylish appeal to the umbrella. A sufficiently large offset umbrella can provide you with enough space for a table and chairs that you can use to enjoy outdoor meals with your friends and family, or for other types of furniture depending on how you want to use it. What is special about these umbrellas is that they provide good shading for a fairly large area in the outdoor setting, without the obstructive middle pole of a typical outdoor umbrella. The controllability of the umbrella is also a factor that sets it apart, as opening, closing and positioning of the umbrella can be done from its side, without disturbing the people already seated at the table. A gazebo usually provides you with more sheltered space than an offset umbrella and can be completely enclosed with side panels for privacy as well as for protection from bad weather and bugs. On the other hand, the offset umbrella does not require a lot of space and can be easily moved around, so you can enjoy the outdoors wherever you prefer, whether in your garden or in your patio. When choosing a gazebo or an offset umbrella, there are a number of important features you should be looking for, so that it may last for many years and provide you with the outdoor enjoyment you are looking for. In the following sections, we will provide you with the list of important features to consider when getting a gazebo or an offset umbrella, and we will provide you with the best and most popular ones bought by Amazon customers. Dimensions: First, you need to consider the space that is available for the gazebo and the furniture it will contain. When installed on a small patio or deck, a square model of 10 'x 10' would be quite appropriate, as it can easily accommodate a table and comfortable chairs for four people. Larger gazebos that measure 10 'x 12' can easily accommodate a table and chairs for six people, or can be furnished as game room, a lounge or even host an outdoor spa. Note that even larger gazebos are available. Structure: Most quality gazebos are made of powder-coated aluminum. They are weather resistant and can last for years even without dismantling them during the winter (unless the manufacturer recommends otherwise). Some aluminum gazebos will have parts made of hard plastic. Those will cost less, but may not withstand the rigors of winter. Finally, those that are made of steel are solid, but subject to corrosion, so they must be dismantled and stored for the winter, unless they are made of powder-coated/galvanized steel which is guaranteed against rust and corrosion. Posts: The thicker the posts, the stronger your gazebo will be. Note also that while posts placed in a triangle (3-posts) may offer a good degree of stability, gazebos with posts placed in a square (4-posts) are stronger and more stable. Roof: Subject to rain, wind and sun, the roof is the part of the gazebo that is most likely to deteriorate over time. The roof that comes with some of the less expensive gazebos may need to be changed after only two or three years. You should be looking for a roof that is waterproof, solid enough to withstand strong winds, and that is guaranteed against fading. Roofs made of polycarbonate which is ultra-resistant hard plastic, as well those those that are made of poweder-coated aluminum or powder-coated/galvnized steel are the best, and they can usually be left installed permanently, summer and winter (but snow accumulations should always be removed from the roof). Vent: This is an opening in the middle of the roof to evacuate the wind. On low cost gazebos, a piece of fabric held by seams at the four corners crowns the opening. If the garden or patio is very exposed to winds, it is better to opt for a stronger vent, consisting of a raised metal structure with a mosquito net. Curtains, Nets & Rails: Gazebos with curtains and nets cost more, but they provide you with privacy and protection against mosquitos. They will also protect you from strong winds and from getting wet when the wind pushes the rain sideways inside the gazebo. Rails are used to open the curtains and nets by dragging them from the center to the posts. The gazebos presented below are the most popular and best rated ones bought by Amazon customers at the time of this writing. 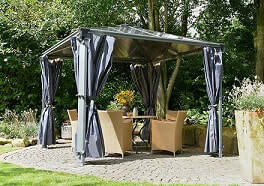 ​Please click the Amazon product links below for the selected gazebos to see exact price information or to purchase. Elegant 10’ x 10’ square gazebo with high roof for maximum head room. Weigs 145 lbs. Available also in 12’ x 12’ and 14’ x 14’ . Sturdy and durable, rust-resistant anthracite powder-coated frame made of heavy duty aluminum and galvanized steel connectors. Polycarbonate roof panels provide 100% harmful UV blockage and protection from rain. Will not discolor, fracture, shatter or become brittle over time. Can withstand severe weather conditions – no need to take structure down or remove panels during winter season. Just remove any snow accumulation. Integrated gutter to control the flow of rain water. Decorative wind & smoke escapement feature at the top of the gazebo for enhanced air flow. Simple two person DIY assembly – ready to assemble; all screws included. Anchoring and foot-pads included – structure can be relocated and anchored to any surface. Integrated rails and hooks for adding curtains or mosquito net. ​Mosquito net and curtains not included. Can be bought separately (see below). Offered in bluish gray color. For exact price info or to purchase, please click below. ​Elegant 10’ x 10’ square gazebo with high roof for maximum head room. Weighs 176 lbs. ​Available also in 10’ x 12’. High quality powder coated aluminum structure. Galvanized steel roof which blocks completely the sun light and UV rays, and protects from rain. Two-track rail system to receive the nylon mosquito net and curtains. ​Entry head-room under rails: 76.75''. Mosquito net is included in your box and privacy curtains are sold separately (see below). Equipped with a hook on the very top that can be used to hung a fan or light fixture. ​Can be anchored to a concrete deck or patio. Anchoring hardware not included. No need to store the roof away for the winter, but any accumulation of snow should always be removed from the roof. Possible to order replacement parts if needed. ​Assembly may be done by two people. The galvanized steel roof has a 2-year warranty against rust perforation. ​For exact price info or to purchase, please click below. Elegant 10’ x 12’ square gazebo with high roof for maximum head room. Weighs about 425 lbs. Aluminum & steel, powder coated, rust resistant frame. Hard top durable steel roof, powder coated to resist rust, corrosion and chipping. Blocks completely UV rays. Vented roof for optimum airflow and comfort. Stylish look that is sure to add an element of tranquility to your outdoor seating area. Built-in rails for the mosquito net and privacy curtains. Includes mosquito netting on all four sides. Has a hook on the very top that can be used to hung a fan or light fixture. Can be left up in the winter, but the snow should be cleared from the roof. ​Comes in dark brown, nearly black, with very fine gold speckles and some light brush-effects. Can be anchored down, so it can be installed on a deck or patio. Anchoring hardware not included. ​Assembly can be done by two people, but lifting the roof may require more than two. ​Comes with a 6 months warranty. Dimensions: This is of the most important factor to consider. You simply need to measure the size of the area you want to protect from the sun's UV rays and other weather conditions. Offset umbrellas come in various sizes, so it should not be very difficult to find one that fits the area you want to protect. Structure: If you don’t want to pay too much, you may want to consider an offset umbrella with a pole and other mechanical parts such as the ribs made of hard plastic. On the other hand, if you want a more solid umbrella, you should consider one made of all powder-coated aluminum. Though they would be more expensive, they will last much longer. Fabric: You will find that offset umbrellas come in various types of fabric. There are those that are made of synthetic fabrics capable of protecting from rain, but also thicker fabrics that provide better protection against UV rays. Fade-resistant, solution-dyed, waterproof polyester fabrics are excellent and can offer 98% UV protection. Weight Plates: Most offset umbrellas are equipped with a cross base which is the part that sits on the ground and that supports the pole. But sand filled weight plates need to be place on the cross base to provide the umbrella with the required stability. Usually, these weight plates are not included in the purchase of the umbrellas, but are available to be bought separately by the manufacturer. The offset umbrellas presented below are the most popular and best rated ones bought by Amazon customers at the time of this writing. Please click the Amazon product links below for the selected offset umbrellas to see exact price information or to purchase. 11 ft. wide canopy made of fade-resistant, solution-dyed, waterproof polyester that offers 98% UV protection. Equipped with a crank lifting system that allows easy opening and closing of the umbrella. Provides maximum shade with multi-position push-button vertical tilt function (5 positions). Comes with a storage cover included. Equiped with a strap that easily wraps around the closed umbrella using velcro to keep the umbrella closed and secure. Cross base is included, but base plates for weights are not included. (See Amazon link below for plate weights)​​. ​Wind vent at the top to allow air flow and reduce wind pressure to enhance stability. Offered in four colors (beige, tan, cocoa and dark red). 10 ft. wide canopy made of fade-resistant, solution-dyed, waterproof polyester that offers 98% UV protection. Crank mechanism for easy 360 degree rotation: The simple slider mechanism makes it easy to crank to the desired angle. Storage cover not included, and needs to be bought separately (available on Amazon). Cross base is included, but base plates for weights are not included. See Amazon link below for plate weights. Wind vent at the top to allow air flow and reduce wind pressure to enhance stability. Offered in four colors (beige, blue, green and red).